Your kids won’t listen to you? 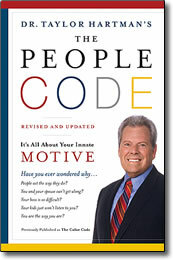 In his life-changing book, Dr. Taylor Hartman introduces you to the People Code and why people do what they do. The concept of Motive is a fresh method for analyzing your own innate personality as well as that of those around you. You then have the ability to utilize that knowledge to improve workplace and personal relationships. He then explains how to ensure that all possible alliances between them function at optimum effectiveness. Previously published as The Color Code, this unique and insightful book helps you discover what truly motivates you and the people you associate with. Go ahead, take the test, and discover your true color, find out what makes you (and others) tick. Gain insight into your own primary motivations, identify and develop your natural strengths and transform your weaknesses. You then have the ability to utilize that knowledge to improve workplace and personal relationships. If you struggle with self-acceptance or have questions about why you and others act the way you do, Dr. Hartman and The People Code can help you maximize your life success by improving your day-to-day relationships.